Suitable for effective full-body workouts, the Fitness Mad medicine ball 6kg (13.2lbs) not only improves strength, agility and flexibility, but also helps to burn more calories and adds intensity to your training sessions. 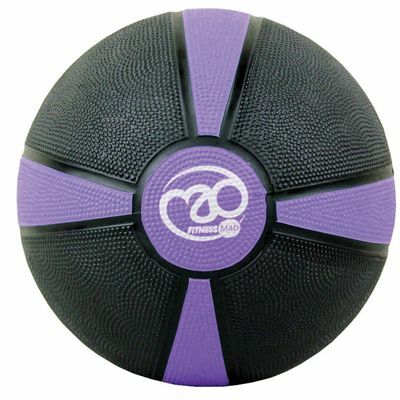 This waterproof ball is made of durable rubber and has a diameter of 22cm (8.6"). Allowing for a full-range of motion, this easy-to-grip- ball provides versatile workouts and enables you to strengthen shoulders, back, arms and legs, as well as to target core muscles and challenge your balance skills. for submitting product information about Fitness Mad Medicine Ball 6kg We aim to answer all questions within 2-3 days. for submitting product information about Fitness Mad Medicine Ball 6kg. We aim to answer all questions within 2-3 days. If you provided your name and email address, we will email you as soon as the answer is published. for submitting product review about Fitness Mad Medicine Ball 6kg.